Anyone who rides needs to have a reliable hand pump or CO2 system to fix flats when biking. And know how to use it. I had some bad experiences with CO2 inflators in the past, with the cartridges invariably shooting off all of their contents before I could even attach them to a tube. My problem was probably due to using non-threaded cartridges, but I was too frustrated to even go any further with CO2 as an option. CO2 systems are awesome, when they work. They fill a tube in seconds and give you enough inflation to actually continue your ride. But what do you do when you expend all of the cartridges you have and are still left with a flat? I am not the only one to have such troubles; an editor at Bicycling Magazine recently wrote an article in the print edition confessing her embarassment that she did not know how to use a CO2 inflator and set aside a few hours to practice until she mastered several models. I was looking for a link to the article to post, but could not find it online. I got used to just carrying a regular old hand pump. When struggling to put enough pressure in, the pump would sometimes break the captive nut on the tube, ruining the tube. Even when that doesn't happen, you can usually only get enough inflation with a hand pump to allow you to get home or a nearby bike shop. I knew I had to come up with a better solution. 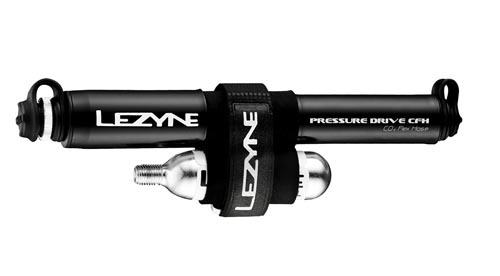 I ended up getting the Lezyne Pressure Drive CFH. It's actually a CO2 & pump combo kit, giving you more than one option to inflate your tire. Lezyne's design and construction reputation has always made their products come highly recommended. True to their heritage, the Pressure Drive CFH is made of CNC machined aluminum in a sleek, compact package. It comes with a small pump (about 7 1/2" long), a frame attachment for installing to a bottle cage mount, a double CO2 cartridge holder, a 16 gram threaded CO2 cartridge, and a braided steel flex hose that stows inside the pump shaft. Both ends of the pump have rubbed dust caps. The other attractive feature for me is the removable flex hose, which provides a bit of flexibility when attaching the pump to the tube valve, giving you room to operate and also protecting the captive nut from breaking. The hose has a threaded attachment to further secure the connection to the valve. The attachment can be flipped around to work with either Presta or Schrader valves. The flex hose serves double duty, as it is used for both the hand pump and CO2 inflation. The idea is to use the CO2 cartridge first, and if you get another flat you have the pump as a backup. In this configuration, the pump body slides into one of the double barrel cartridge holder slots, and the CO2 cartridge goes in the other. A velcro strap keeps the parts cinched together but the metal parts are kept separate to eliminate chattering. The unit can then be mounted on the frame mount, or it is small enough to fit in a jersey pocket as well. You can also put the pump in the frame mount, and separately mount two CO2 cartridges on a seatpost using the double barreled sleeve. If you would rather carry the CO2 inflator setup and leave the pump at home, the flex hose and two cartridges can be bundled together and stashed in a jersey pocket or strapped onto a seatpost. I'm not sure how secure the seatpost method would be, especially if you were expecting a bumpy ride. But, the option is there. To use the CO2, the flex hose is screwed onto the tube valve, then the cartridge is screwed onto the other end until completely tight. Back out the cartridge a half-turn and it automatically inflates. There is no shut off to stop the inflation or lock to save unused gas, so you get one shot to inflate with each cartridge. Giving the CO2 setup a shot, I threaded the flex hose onto the valve first, then screwed the CO2 cartridge on all the way. The instructions stress that it must go on fully tight to puncture the seal. When you back the cartridge out 1/2 turn, it automatically inflates. I kept the double barrel cartridge holder on thinking that the cartridge would freeze in my hand. Not only did the holder get in the way, I really didn't need it. The only two areas that frosted up were the connectors to the valve stem and to the cartridge on the flex hose. The instructions didn't really discuss the order to disconnect the attachments, it only states that extra CO2 may be released from the system when removing the hose. I unscrewed the CO2 cartridge first, and started hearing some air coming out. It sounded more like actual fill air than "extra" air that may have built up in the hose. I kept hearing a slow release so I quickly screwed off the flex hose and closed the nut. Checking the inflation with a floor pump, it came in at just under 100psi, even with some escapage. Not bad at all, and definitely enough to allow you to finish a ride. Next time, I will wait for the flex hose to thaw out and remove that first and see if that prevents some air leakage. Overall, an easy experience that made me feel more confident using CO2. I have used it only a few times as a hand pump so far, and it is just as difficult to inflate more than 70psi in a road tire as other pumps. Am I really that weak that I can never come close to a pump's claimed maximum psi rating (120psi in this case)? The major difference I feel is relief that I am not going to break the captive nut on the tube in the process thanks to the flex hose. The pump feels solidly made. However, the rubbery dust caps are kind of a nuisance when pumping as they interfere with my hand positioning. Especially the cap covering the flex hose storage, as it is right on top of the pump cap. I find myself removing it to get it out of the way. Another minor issue I had is the threading on the inside of the flex hose storage compartment is plastic, and I managed to cross-thread it after using putting the flex hose away after one or two times. It was difficult to neatly screw the flex hose down into storage position, but I think I successfully chased the initial threading enough to straighten that out. The flex hose is also a bit more rigid and shorter than ideal, but it does its job. All in all, the Lezyne Pressure Drive CFH is not a total miracle tonic for curing all of my flat inflation woes, but it is definitely a huge improvement. I will feel more comfortable relying on CO2 to get me rolling again quickly, with the reassurance that I have the pump as a backup and won't break my replacement tube thanks to the flex hose. The compact bundle also saves a lot of room and weight compared to carrying my old hand pump, CO2 inflator, and loose cartridges.